During neural development, highly motile structures on the developing neurites, called growth cones, are guided by signals from the extracellular environment. Guidance cues come in many different forms, from diffusible extracellular proteins and lipid factors, to extracellular matrix proteins and/or carbohydrates located on the cell substrate. 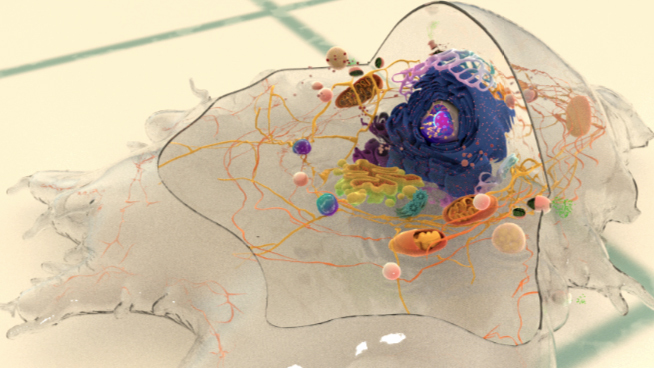 They may also originate from membrane of adjacent cells. Guidance cues are secreted or expressed at the right time and place. The absence of the factor, or mutations in their receptors, lead to growth cone navigational errors. The secretion or expression of the guidance cue is sufficient to cause attraction/repulsion of the filopodium/growth cone (reviewed in ). 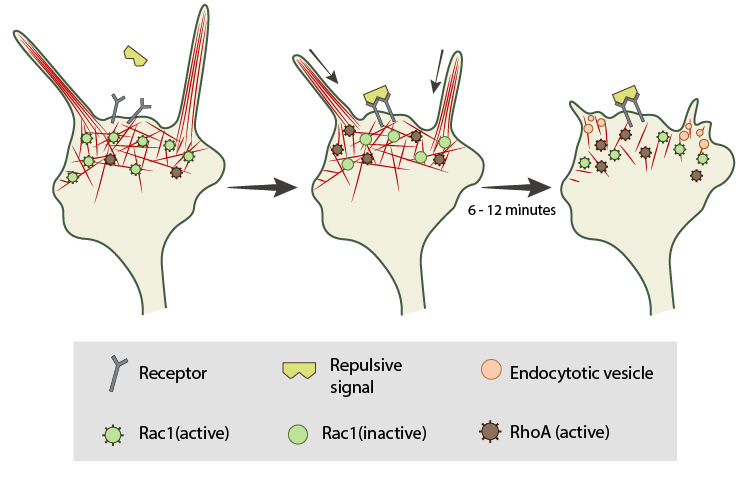 In most cases, there are multiple receptors for each guidance cue; however, it is widely known that the final outcome resulting from guidance cue-induced events is dependent upon the cell type, the duration the signal is ‘on’, the state of the cell (e.g. differentiation state, cell cycle stage, etc), and the concentration of the guidance cue. The guidance signals for neuronal growth cone movement are among the most widely studied  (reviewed in ). The generation of a signal concentration gradient allows cells to use a directional sensing program to generate “front”-specific responses at the region where the signal is the highest and “rear” specific responses where the signal is the lowest. The activation of localized signal transduction events results in positional cues that promote the relocalization of certain proteins to the front or back of the cell. Subsequent cytoskeletal restructuring redirects the migration of the growth cone (reviewed in ). The final response to many guidance signals can be affected by the level of both intra- and extracellular calcium . In neuronal growth cones, filopodia protrusion is induced when an attractive cue binds to its receptor on the cell surface. Receptor-binding transiently activates Cdc42/Rac1 GTPase and subsequent recruitment of adhesion molecules and components of the actin polymerizing module (e.g. Arp2/3 complex and formins such as mDia2)which together promote filopodia protrusion. Rac1/Cdc42 activity is then locally reduced in the filopodium, which allows RhoA and its effector, ROCK, to become activated; ROCK is involved with subsequent stabilization and maturation of adhesions, which supports migration in the direction of the attractive signal. Most known attractive signals act as chemoattractants, often generating the formation of adhesion molecules within the growth cone to promote selective extension of the filopodia towards the cue, whilst ensuring the formation of filopodia or lamellipodia is decreased in other directions. This occurs through a decreased retrograde actin flow in the direction of the contact [20, 21]. Such attractive cues are propagated by the Rho family of GTPases (e.g. Rac1, Cdc42 and RhoA) following ligand-induced receptor binding to the cytoskeleton (reviewed in ). Attractive cues such as brain-derived neurotrophic factor (BDNF) activate Cdc42 and Rac , and Rac1 activity in turn influences the initial formation of integrin-dependent adhesions in the growth cone. In this case, further adhesion stabilization and continued migration requires proper coordination between Rac1 and RhoA GTPase activity . Local signals may also redirect the signal through other recruited components . In the case of repulsive signals, the actin assembly module is suggested to rapidly terminate growth in synchrony with the release of linkages between the cytoskeleton and the membrane . Growth cone collapse is a key example of how neural cells respond to repulsive cues by altering actin filament dynamics. Growth cone collapse involves numerous signaling pathways including Rho GTPases , ADF , and kinases . In neuronal growth cones, filopodia protrusion stops when a repulsive signal binds to its receptor on the cell surface. Receptor-binding transiently inactivates Rac1 GTPase and prevents it from promoting actin assembly. Resumption of Rac1 activity coincides with filopodia collapse and is required for endocytosis of the collapsing plasma membrane and reorganization of F-actin . 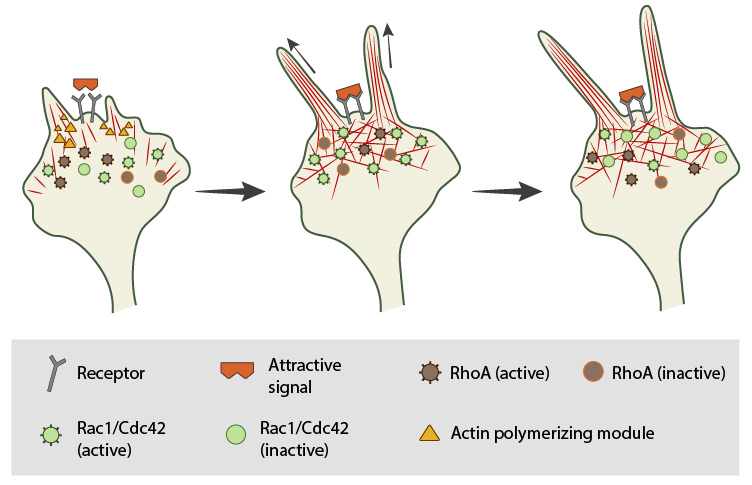 RhoA and its effector, ROCK, are activated downstream of repulsive cues [31, 32, 33] and their activity has been implicated in reducing actin polymerization following treatment with repulsive signals . A model for filopodia collapse in growth cones was created using the repulsive signal, semaphorin IIIA (SemaIIIA; collapsin-1). Another example is reelin, a large secretory protein that inhibits filopodia formation through a pathway involving Fyn or Src kinase-mediated phosphorylation and inactivation of mDab1 (mouse Disabled homologue 1) . Phosphorylation of mDab1 reduces the activation of N-WASP and Arp2/3-dependent actin polymerization . Lamellipodial and filopodial protrusions at the leading edge of migrating cells and neural growth cones are exposed to a number of guidance cues simultaneously and the proper integrated response is necessary for proper cell/growth cone guidance and maintenance. In certain cases, prior exposure to one signal initiates cytoplasmic events that prevent or ‘desensitize’ the cell to subsequent guidance cues (reviewed in ). Cyclic nucleotides can regulate growth cone behaviours by converting repulsive signals into attractive signals through the activation of cyclic guanosine 3′,5′-monophosphate (cGMP) and cyclic adenosine 3′,5′-monophosphate (cAMP) signaling pathways, respectively (reviewed in ). For example, the small molecule netrin, induces attractive or repulsive signals depending on the type of receptors expressed and on the intracellular level of cAMP . Other guidance cues function as attractants for one navigational event and a repellent for another (reviewed in ); similarly, the signal molecules that are activated by these guidance cues frequently antagonize each others’ activity, emphasizing the importance of proper coordination between these signaling components . Not surprisingly, mutation(s) in the signaling pathways that are used by guidance cues frequently results in aberrant navigation (reviewed in ).